For professional darts in Germany and for all tournaments and competitions, the German Dart Association has the mandatory dimensions and Rules established in the sports competition rules. Anyone who would like to set up a dartboard privately for training or for sociable darts with family and friends, should nevertheless stick to the official dimensions so that the training effect does not fizzle out. How far is the distance to the dartboard? WARNING: Since 01/01/2016, the clearances for Soft and Steel Dart have been adjusted. The distance from the throw line to the dartboard is ALWAYS 237 cm. How high does a dartboard have to hang? The height is always measured from the floor to the Bulls Eye. Before, you should use a calibrated spirit level to check if its wall is straight. If this is not the case, measure with the measuring tape or the ruler on the spirit level. Many of our electronic and classic dartboards include detailed instructions for mounting and mounting the board on the wall at the correct distance to the throw line and to the floor. 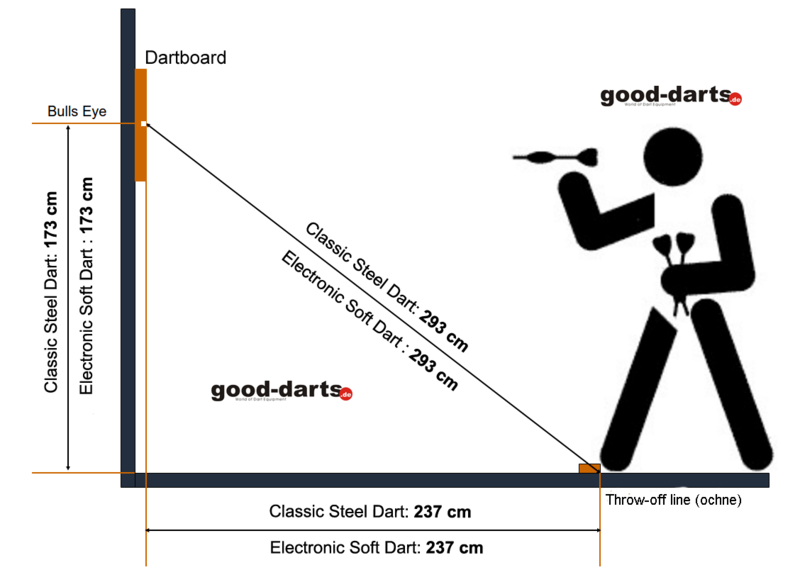 On the sketch above you can see very well that the distance from the throw line to the dartboard is a little lower than the one above The Steel Dart Board hangs one centimeter higher than the Electronic Soft Dart Board. OFFICIAL MAY AND DISTANCE TO SOFT DART? HOW TO MEASURE THE DEVICE CORRECT? However, the diagonal is decisive in the competition order. This is one reason why bullseye is always measured. If you find it difficult to measure the diagonal, you can use a distance measure. manage. You can buy this from specialist retailers, you can also make it yourself. One end is fastened in the bullseye, the other end marks the ejection line. Another reason why the bullseye is the key measurement point are the different designs of dartboards. Round or square shapes make it difficult to uniformly hold the dartboard. Therefore, the bullseye as the central, fixed point of a dartboard is always the reference point. Some of the dartboards already come with a pre-made template that allows them to transfer the markings for the holes to the wall. If such a template is not included, you can make it yourself with simple means to simplify the installation of the dartboard. For the creation of the stencil, a large sheet of paper in A3 format is suitable. If you do not have this at hand, you can also glue 2 smaller A4 sheets together with some adhesive tape. Place your dartboard with the number segments down on the floor. Take a look at where the four drill holes are located approximately at the outer edges. Then place the blank sheet of paper on the dartboard and mark all the holes on the paper so that they are still visible later. Now take the sheet of paper from the dart board and place it on the floor or a table to connect the marked points diagonally with a line. This results in the middle of a point that marks the Bulls a dartboard. Some dartboards are not quite up to standard. 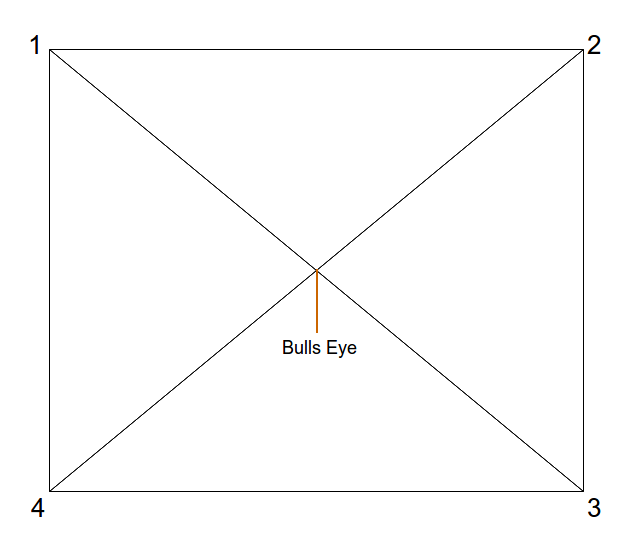 In any case, please check if the cross on your template matches the actual position of the Bulls Eye. Place your template on the front of the dartboard and adjust the position of the marker if necessary. During the preparation of the dartboard you have to pay attention to the wall on which you want to hang the dart. Basically, blankets are suitable for attaching the dartboard. Not only do they have the necessary stability, but they also develop a lower resonant volume, such as, for example, (inside) indoor walls, or even doors or cabinets. Your neighbors and roommates will be grateful to you, because for them it can be very annoying if the resonance of the wall is too high. For increased sound insulation, in such cases, even thin sheets of cork or similar materials can be very useful as soundproofing. If several dartboards are to be placed next to each other, for example in a clubhouse, then the so-called open space or play area must be observed. It is particularly important that every darter has a right to perform his litter unhindered. In addition, injuries should also be avoided. In addition to the actual throw sector, the game area also has an area of ​​150 cm behind the pitcher. The margin regulation is mandatory for championships. 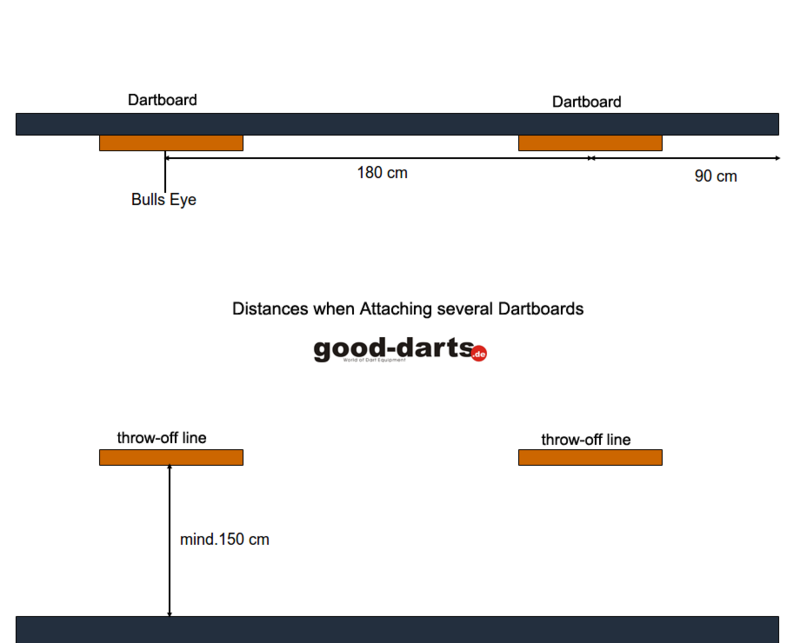 The distance between two dartboards must be at least 180 cm from Bull's Eye to Bull's Eye. The distance between a dartboard and the (side) wall should be at least 90 cm. How to properly set up a dart machine? In the case of a dart machine, the distances must be adhered to. The location of the machine should be level. If you do not place it on a wall, the clearance behind the unit must be taken into account. With the help of a spirit level, the machine is aligned exactly. He must be exactly in the balance from right to left as well as from front to back. If the machine is exactly aligned and the height of the bullseye corresponds to the ground to the specified size, you can specify the area in which the diagonal is measured.